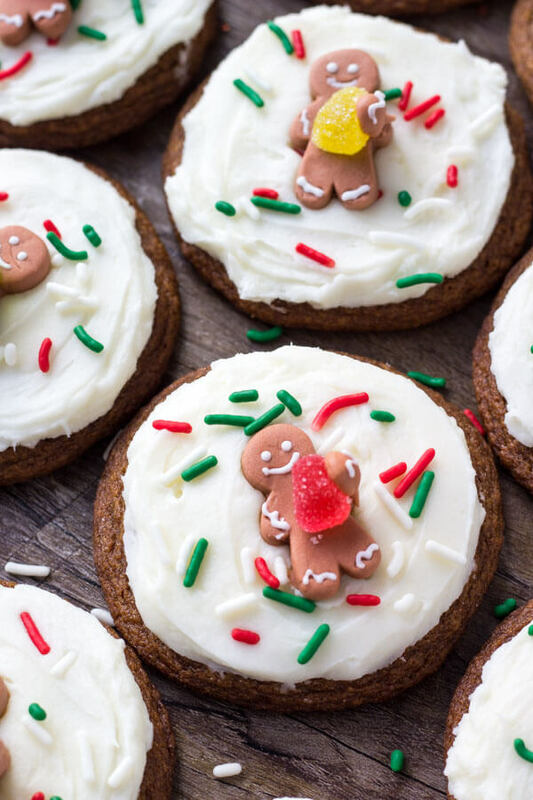 These easy gingerbread cookies are soft, chewy & perfect for the holidays. It’s a no chill recipe – so they take way less time to make than regular gingerbread cookies. Then they’re topped with fluffy cream cheese frosting. 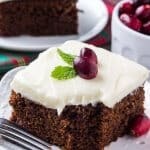 I absolutely love gingerbread. Nothing says Christmas like the smell of warm gingerbread cookies fresh out of the oven. And I don’t think a holiday cookie tray is complete without them. Waiting for the dough to chill can be a bit of a pain when you’re in a rush. Rolling out the dough and cutting it into shapes makes a HUGE mess. Sometimes they’re hard and crunchy instead of soft and chewy. Royal icing isn’t that tasty. My decorating skills are subpar at best. So….. 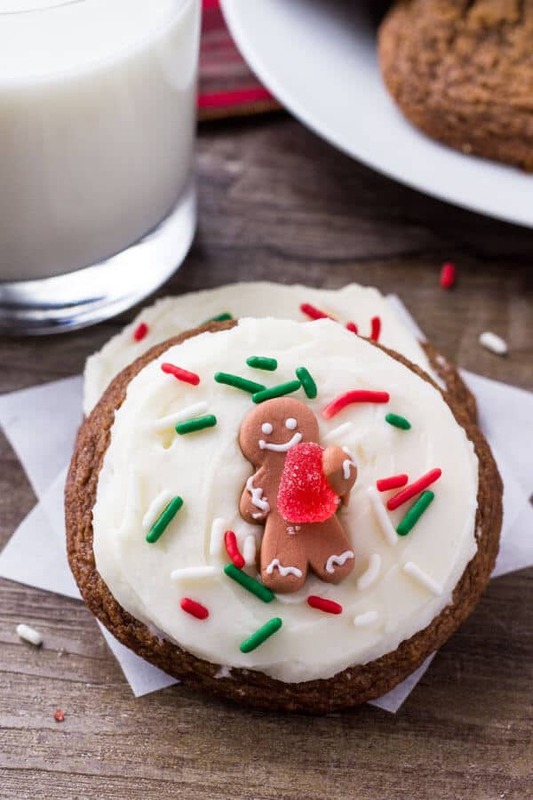 I wanted to make EASY gingerbread cookies that take way less time, way less effort and are completely delicious with creamy frosting. And friends – that’s exactly what we’re making today. 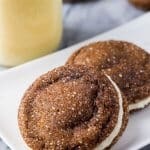 They’re soft and chewy; filled with warm spices, molasses, and brown sugar; then topped with a thick layer of fluffy cream cheese frosting. Plus, they’re super easy to make and take well less time than traditional gingerbread men. For this recipe, we first start by whisking together the dry ingredients. 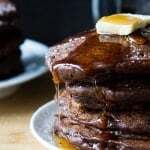 Then beat together the butter, sugar, egg, vanilla extract and molasses. Make sure your butter is soft but not melted here. Then with the mixer on low speed, carefully beat in the dry ingredients. Normally when making gingerbread cookies – this is when you form the dough into 2 balls, wrap in clingfilm and chill in the fridge. But for this recipe we get to skip that entire step. Form the dough into balls about 2 -2.5 tablespoons in size, place on a lined cookie sheet and bake. If you want extra thick cookies, you can pop the cookie sheet in the fridge for 10-15 minutes before baking. Then as the cookies are cooling, make the cream cheese frosting. Beat together the butter and cream cheese, then carefully beat in the powdered sugar a little at a time followed by the cream. 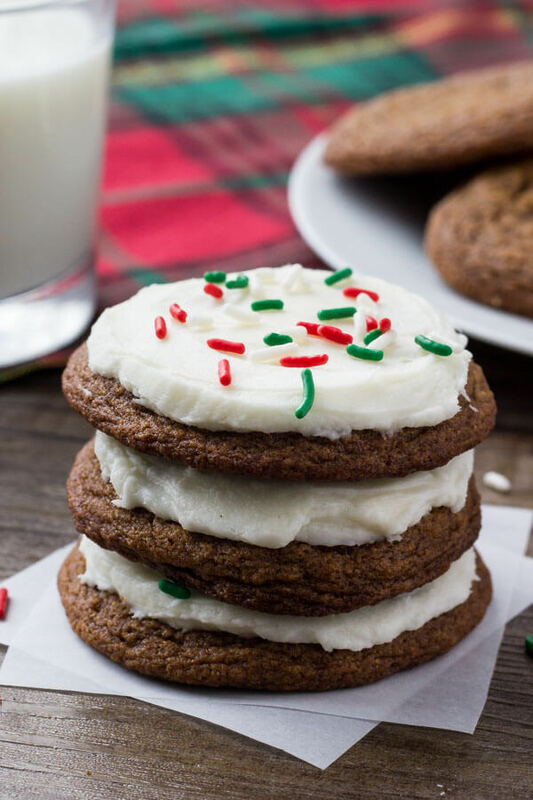 This frosting is creamy, smooth and tastes delicious with the gingerbread flavor of the cookies. Then to decorate – I used Christmas sprinkles and found these absolutely adorable gum drop gingerbread men decorations. 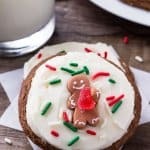 These easy gingerbread cookies have all the flavor of your favorite gingerbread cookies – but have super creamy frosting, are soft and chewy, AND they take way less time to make. Seriously, you’ll never look back! 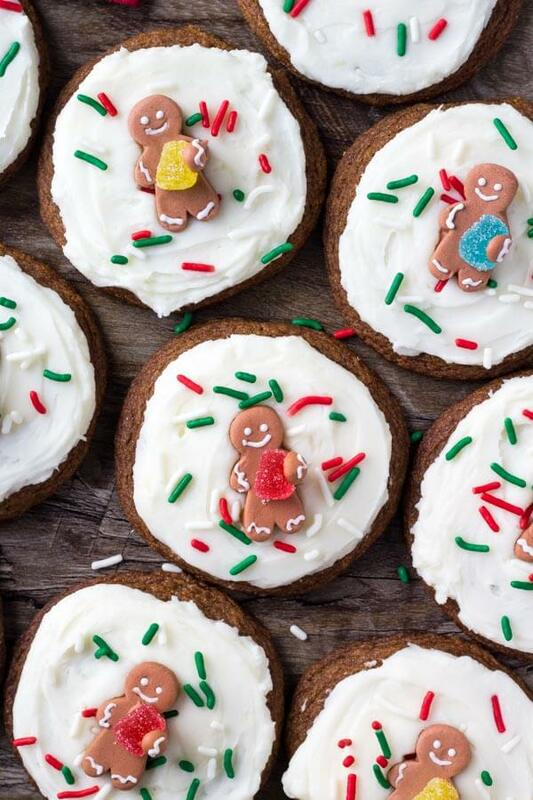 These easy gingerbread cookies are soft, chewy & perfect for the holidays. It's a no chill recipe - so they take way less time to make than regular gingerbread cookies. Then they're topped with fluffy cream cheese frosting. Preheat the oven to 350F degrees. Line baking sheets with parchment paper or silicone baking mats. In a medium bowl sift together the flour, ginger, cinnamon, baking soda and salt. In a large bowl beat together the butter and sugar until fluffy. Beat in the egg, vanilla and molasses. With the mixer on low speed, beat in the flour mixture about 1/2 at a time. Form the dough into balls about 2 tablespoons in size - I use a cookie scoop for this. Place 2 inches apart on prepared baking sheets. Bake for 8-10 minutes, or until the tops are set. 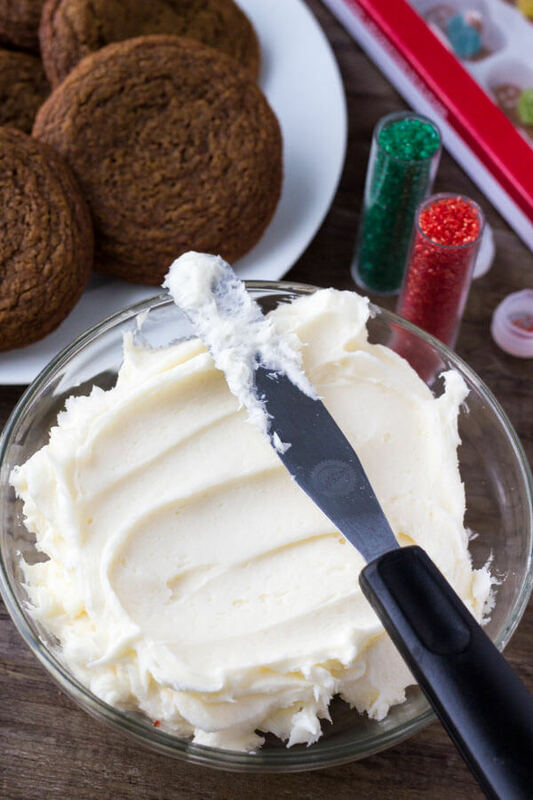 In a large bowl beat the butter and cream cheese together using an electric mixer. With the mixer on low speed, beat in the powdered sugar about 1/2 - 1 cup at a time until you've mixed in 2 cups. Beat in the cream 1 tablespoon at a time, alternating with a little extra powdered sugar until the desired sweetness and consistency. Frost the cooled cookies using a flat knife and decorate with sprinkles. These little gingerbread men are sooooo cute! Love the recipe. 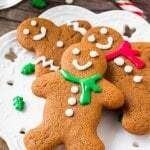 How long could I keep the easy gingerbread cookies fresh? Is it better to keep them in a metal box or a plastic container? Where did you find the toppers?? ?